Cebu Westown Lagoon is a refreshing urban oasis that has been, for the last couple of years, one of my family’s go-to spots. 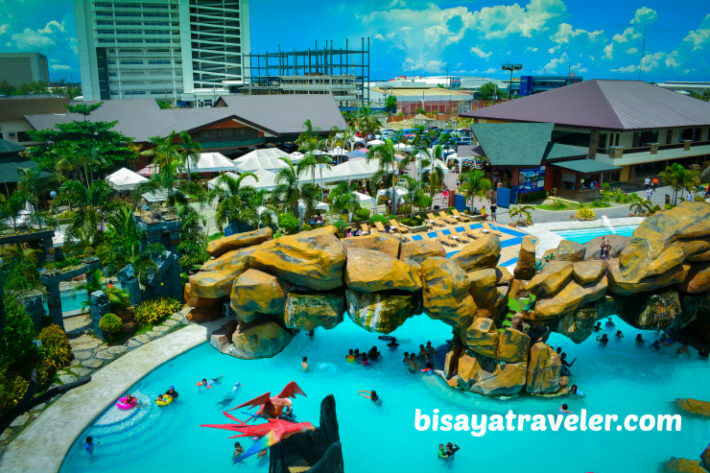 As a matter of fact, Cebu Westown Lagoon is usually the first thing that pops into our mind, whenever we think of a place within Cebu to cool off from the scorching tropical heat. 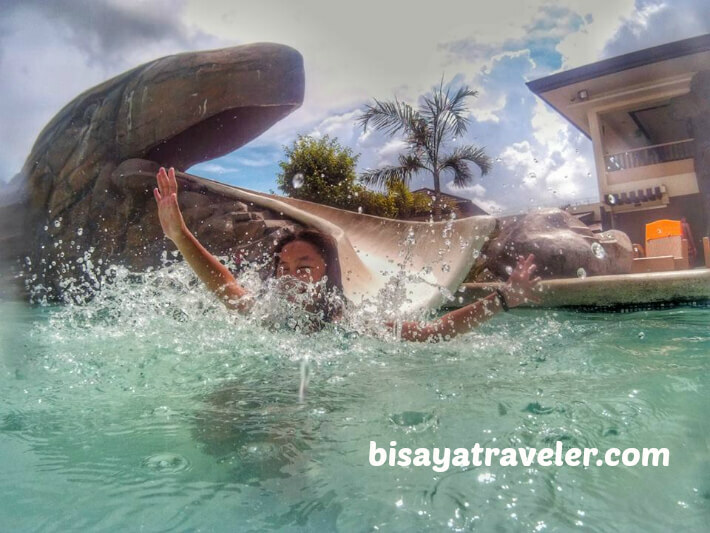 Although quite frankly it has a few drawbacks, this man-made lagoon has enamored us with its cool pools, eye-catching artificial rocks, Aztec-inspired theme, and spine-tingling slides. And besides, it’s one of very few pool resorts that can be easily accessed in metro Cebu. Cebu Westown Lagoon is, in my opinion, a breath of fresh air and a boon for the folks living within Metro Cebu. I admit, it’s not the best nor the most beautiful place to escape the hustle and bustle city life. After all, the province of Cebu is blessed with a wealth of gorgeous beaches and natural wonders, from North to South. 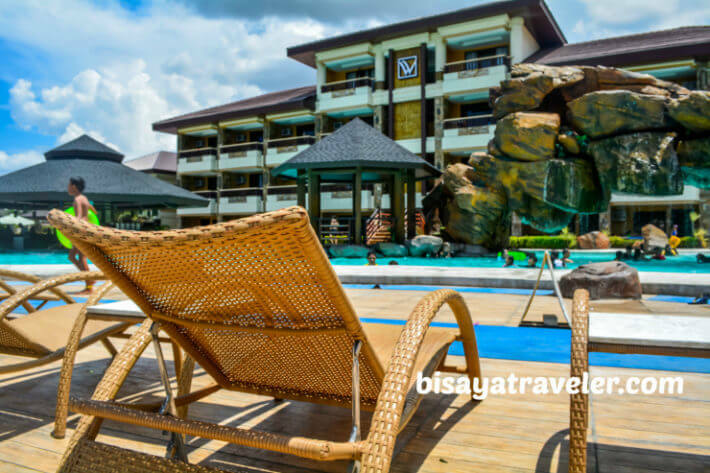 But let’s face it, the thought of having to sit down, and travel for hours to the southern or northern side of Cebu to relax in an awesome resort can dampen anyone’s mood for fun. 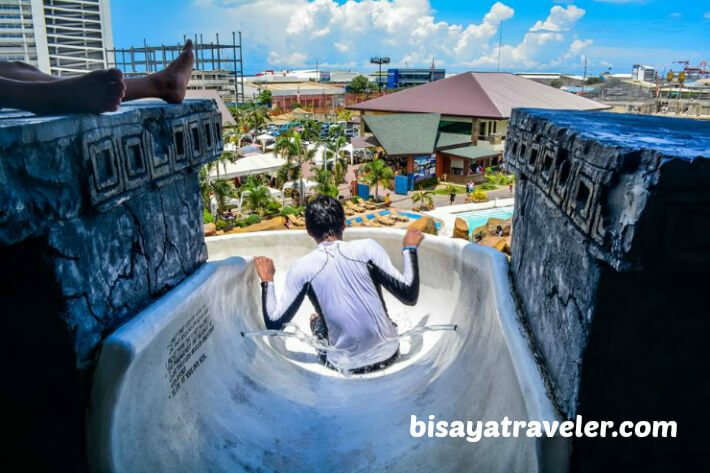 Cebu Westown Lagoon, on the other hand, is located right in the heart of the city of Mandaue, and is just a short drive away wherever you are staying in Metro Cebu. 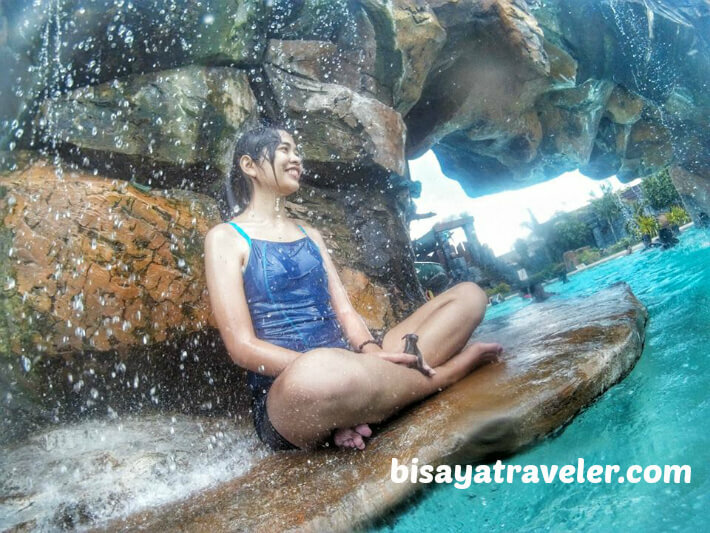 Whether you’re from Balamban or staying in a cushy hotel in Cebu’s uptown area, you can enjoy a soothing and cool respite at Cebu Westown Lagoon without having to take a long drive or a bus ride. Unless there’s heavy traffic congestion in the area, you can get there for less than an hour from nearly anywhere in the metro. With its catchy Aztec design, Cebu Westown Lagoon can give you a little hint of the famous endless running video game, Temple Run. Plus, it has nice gazebos, modernistic rooms, a sunken bar, lounge chairs, boulders, bubbly Jacuzzis and a rock bridge with cascading water. The entire place is pretty small for a pool resort, but there are plenty of spots to snap great photos in Cebu Westown Lagoon. 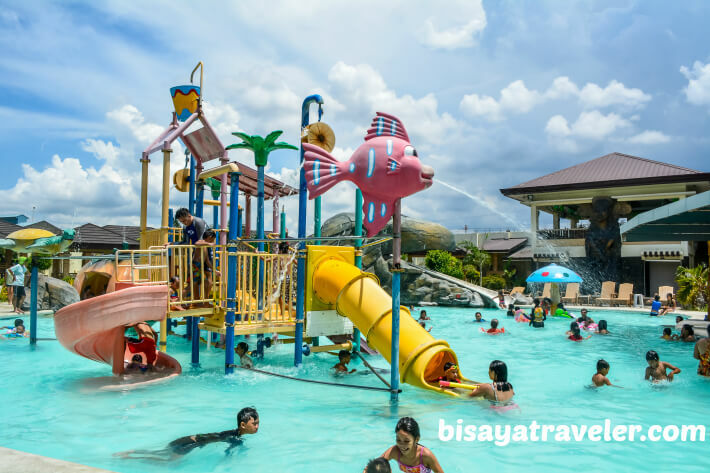 Cebu Westown Lagoon not only has a playground, but it also boasts a wide 2-feet kiddie pool full of surprises. From small slides to spraying fish and water buckets, there are a lot of treats for kids in the resort’s children pool. Not to mention, the resort has a souvenir store that sells water balloons, lifebuoys and a bunch of other toys that can be used on the pool. On my recent visit, my nieces bought a medium-size inflatable ball to play a game of volleyball in the pool. Adults who have an adventurous side may take the long and winding slide on the bigger pool. Not for the faint of heart, the long 30-feet slide in the adult pool is long, fast and has plenty of twists and turns. For people who are a bit heavy like me, you’ll definitely feel the speed and the adrenaline rush, as you go down the slide. Not into watery thrills? Cebu Westown Lagoon has a couple of Jacuzzi pools where you can relax and have a good chat with your friends or family. Bubbly and soothing, these pools can rejuvenate your senses and relax your jaded muscles. Speaking of relaxation, Cebu Westown Lagoon also has a one-of-a-kind sunken bar for people who want to enjoy a drink, while dipping in the pool. Since I don’t drink, and I haven’t experienced hanging out there, I can’t give you any of my personal opinions about the bar. But from afar, it looks a rather cool place to chill and indulge on a few drinks. As I’ve said before, I’m not a food expert by any means, but I can tell a dish if it’s tasty when it hits my taste buds. Unfortunately, the food they serve inside the resort isn’t as mouthwatering as I’ve expected. It’s too salty for my taste, and it took a lot of time for them to prepare and serve the food. My personal recommendation is to bring your own food, when you visit Cebu Westown Lagoon. They have no corkage on beverages and food anyway, except for a whole lechon and alcoholic drinks. As far as I know, there hasn’t been any reported death or incident at Cebu Westown Lagoon. The pools are shallow (2 feet for the children’s pool and 4 feet for the adult pool), and there are 4 to 5 lifeguards ready to help anyone in distress. 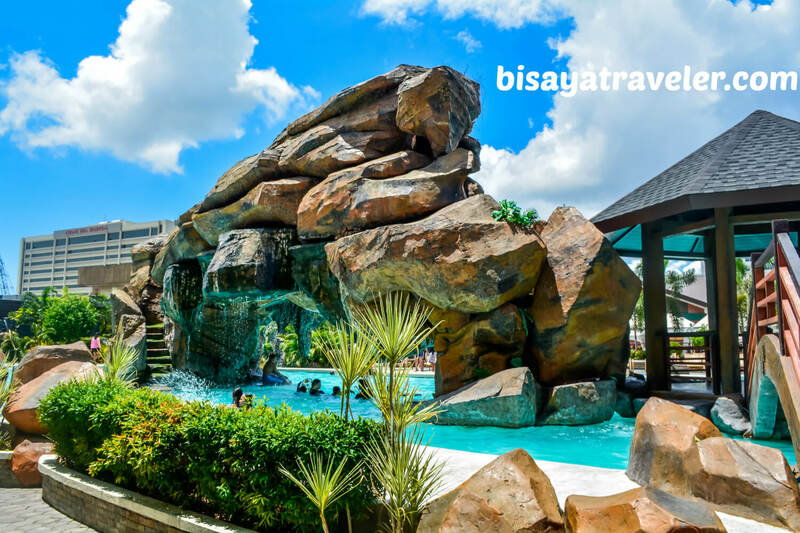 If you’re planning to go there for a family day out, you can go to Cebu Westown Lagoon directly, and pay the front desk to get access to the resort. If, however, you’re planning to stay overnight, you should contact them in advance through their landline, email or Facebook page. And by the way, you don’t have to rent a cottage to get a place to eat or put your belongings in Cebu Westown Lagoon. There are chairs and tables nearby the adult pool where you can stay without having to pay an additional fee. Overall, Cebu Westown Lagoon isn’t perfect, but it’s a great place if you need a quick and convenient respite in the metro. Though their service isn’t world-class, there’s a great deal of room for improvement. Hopefully, the management would take great strides in improving their service as well as their staff’s courteousness, especially in the front desk. Don’t get me wrong – they are easy on the eyes, but sometimes they don’t know how to entertain their customers. On the bright side, the resort has amazing pools, a catchy theme and a myriad of fun stuff.